The Dalai Lama has warned that there are too many refugees in Europe, warning that Germany cannot become an Arab country. Tibet’s spiritual leader urged that refugees should only stay temporarily and return home to rebuild their countries. “The goal should be to return them and help them to rebuild their own countries,” he explains. Germany accepted 1.1million migrants in 2015 from countries in the Middle East. ‘Europe, for example Germany, cannot become an Arab country. Germany is Germany. ‘From a moral point of view too, I think the refugees should only be admitted temporarily’. The IOM announced that nearly 19,000 migrants arrived in Italy in May, which is twice the figure in April. Thousands of Tibetans have fled their Himalayan homeland since China sent in troops in 1951, and many have settled in India. 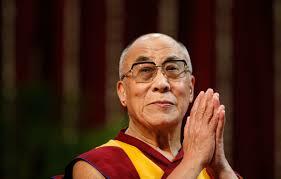 The Dalai Lama is also not exactly a supporter of Homosexuality. I'm not saying he's not a moonbat.